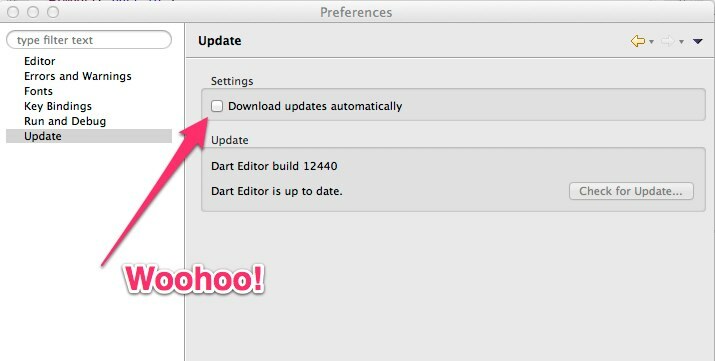 You can now run the Dartdoc tool from the Editor - see Tools > Generate Dartdoc. There's a new clean up to convert old optional parameters to the new optional named ones where possible. There's a new refactoring to convert optional positional parameters to named. The Files view now displays whether a dart: library is client only (like dart:html) or server only (like dart:io). Added a preference to enable code folding. Several performance improvements for large projects. Fix for missing keystrokes in the searchbox (on GTK Linux). And one more thing - Pub support is now in continuous! This is just baked in and still undergoing testing. For those who like to live dangerously, you can get your fresh baked Pub support here. As always, view the changelog for the full list of changes, and to get started with the Editor see our tutorial.